It is November 16, 2015. Today my mama is celebrating her sixth birthday in Heaven. 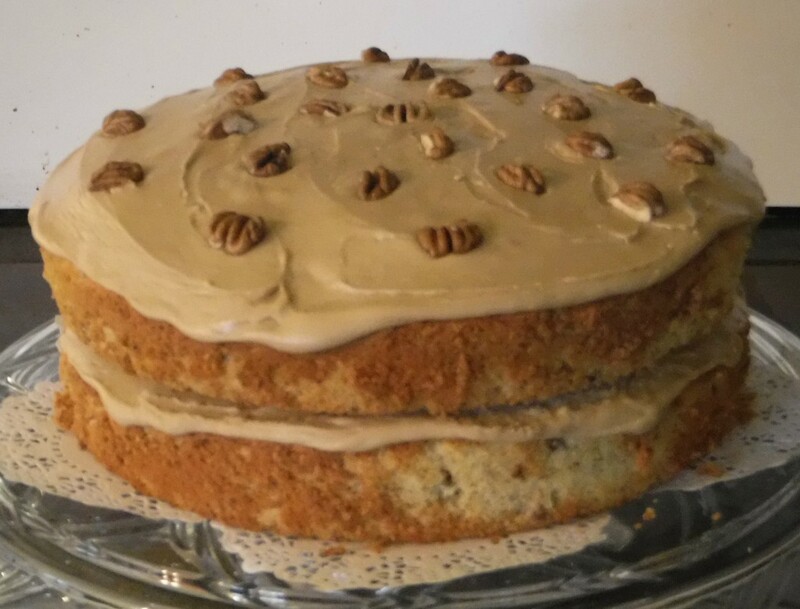 We always had Hickory Nut Cake for Mama’s birthday. Now we eat it in honor of her – and in memory. 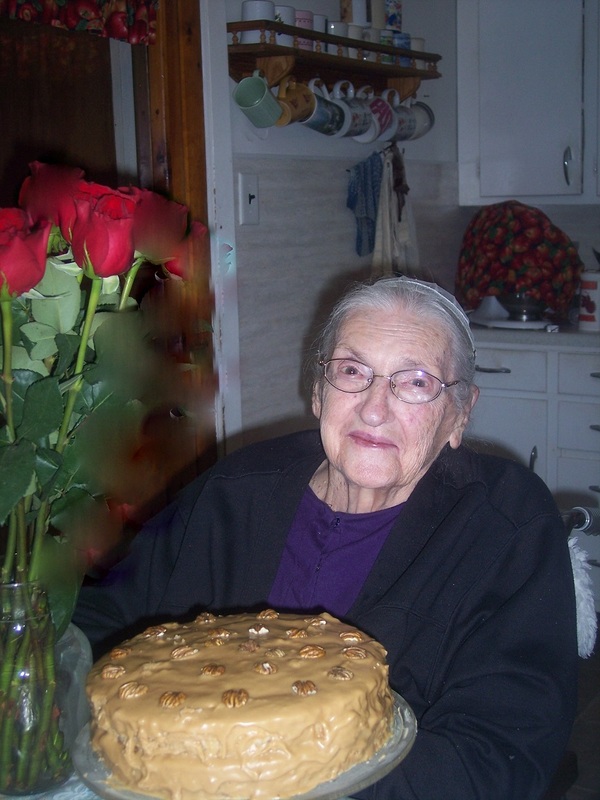 Every year since she has been gone, we remember Mama and her love of Hickory Nut Cake. 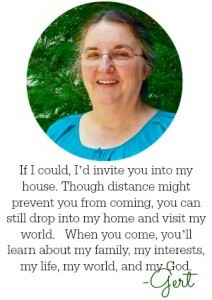 My sisters and I are scattered from Virginia to Maryland to Nebraska to Canada. There are six of us, and each year, at least four or five of us are able to find a meeting place where we can celebrate the woman she was. 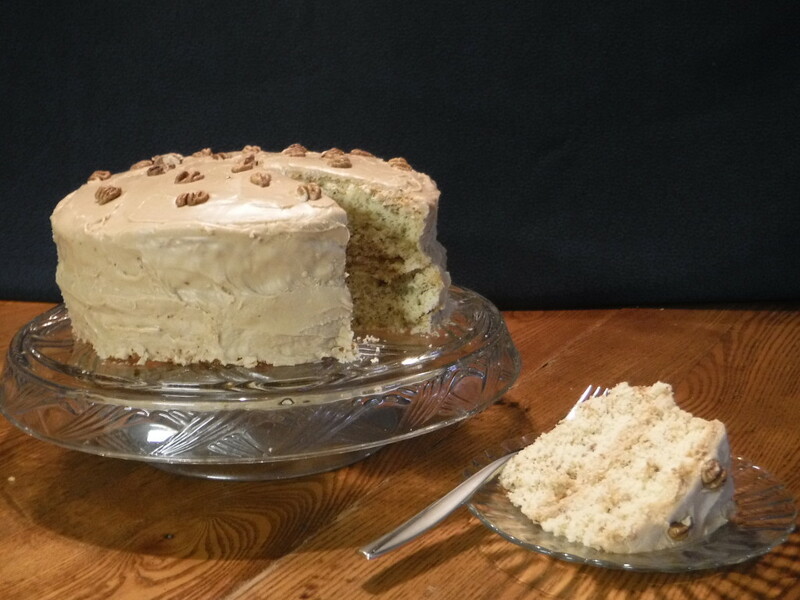 Someone brings the Hickory Nut Cake with that scrumptious frosting (and it isn’t me). 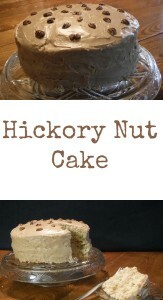 I didn’t realize until recently that our grandmother also made hickory nut cake. 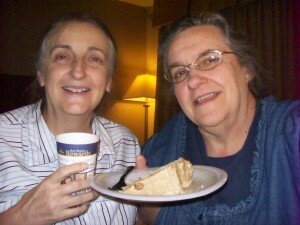 The love of that cake was passed on to her five daughters and her four sons. 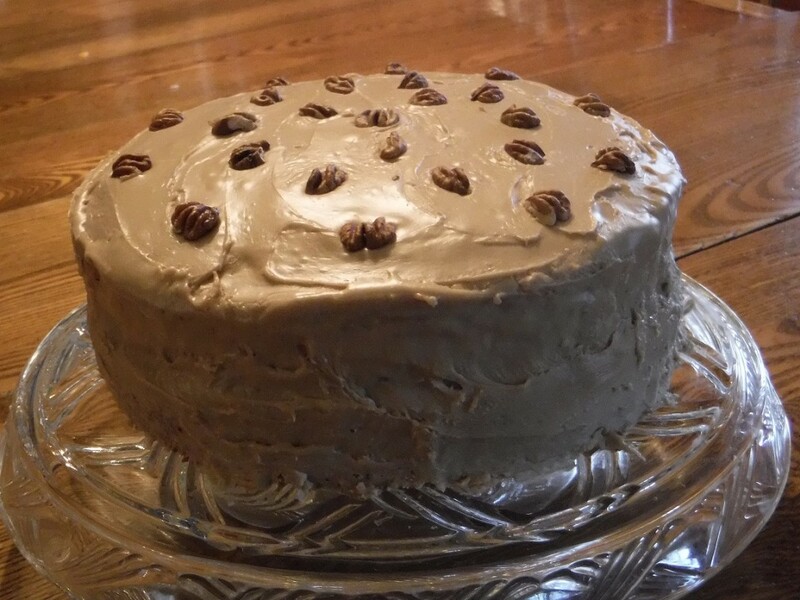 My cousins verified that their parents always enjoyed Hickory Nut Cake, and this recipe (or a similar version) was made regularly in their homes. Each cousin’s family thought it was a tradition for their family. 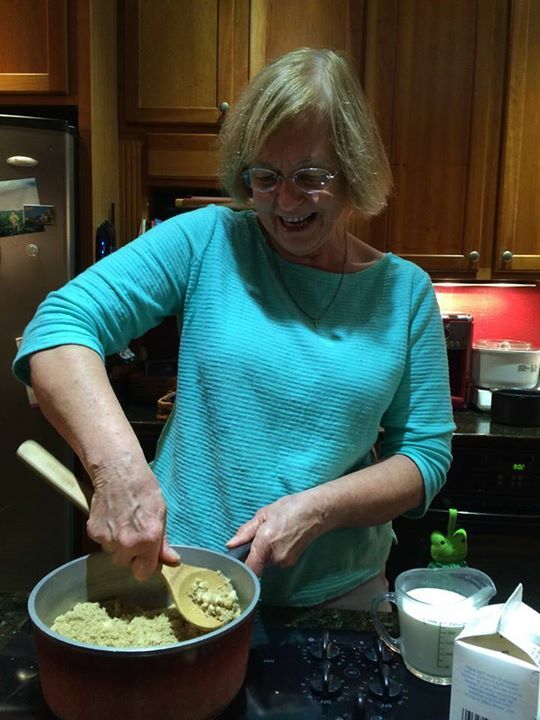 What a delight to find out this love of Hickory Nut Cake is both genetic and environmental! Along with my cousins, my sisters and I have memories of helping crack those nuts and trying to get the entire piece of meat (nut) out without breaking it into pieces. You simply must have whole pieces to put on the top of the cake. We remember sitting outside, using a rock or a hammer to break open the shell, and then picking the pieces out for future baking. Do you have any idea how many hickory nuts it takes to make one cup of chopped nuts?! Quite a few! This year, my Canadian sister Iree was in the states and a Maryland sister, Rachel, drove to Pennsylvania to see her at her motel. She took along two pieces of that cake so they could enjoy it together. When the rest of us meet in a few weeks, Alice will get the remainder of the cake out of the freezer and bring it along to share at our gathering. It’s a simple cake recipe and freezes well. The frosting? Now that’s a specialty! For the cake, you’ll need the usual ingredients: shortening, sugar, milk, salt, flour, baking powder, eggs, and hickory nuts. 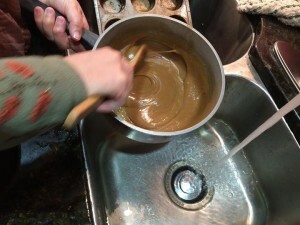 Mix up the batter and put it into pans for baking. 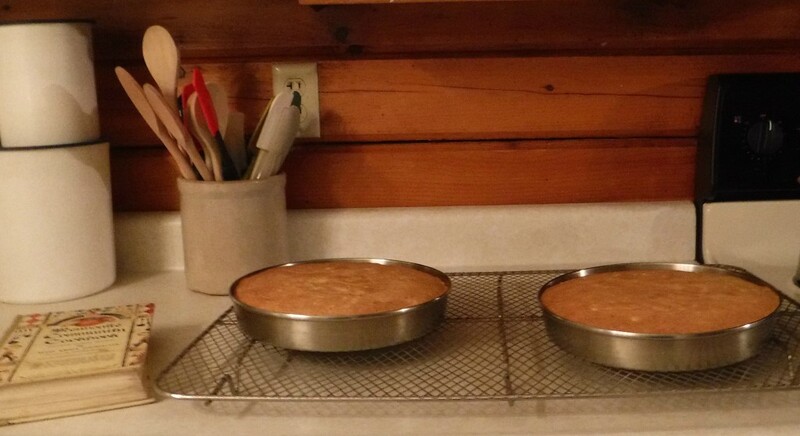 Allow the cake to cool after coming out of the oven. The frosting is what makes the cake. Put frosting between the two layers, and then continue down the sides (if you prefer) and on the top. The frosting recipe is the best there is – if you take the time to do it right. I was fortunate to have a cousin visit my house overnight this past week on her way back to western Maryland. She was delighted to help me make the frosting for our mamas’ cakes! 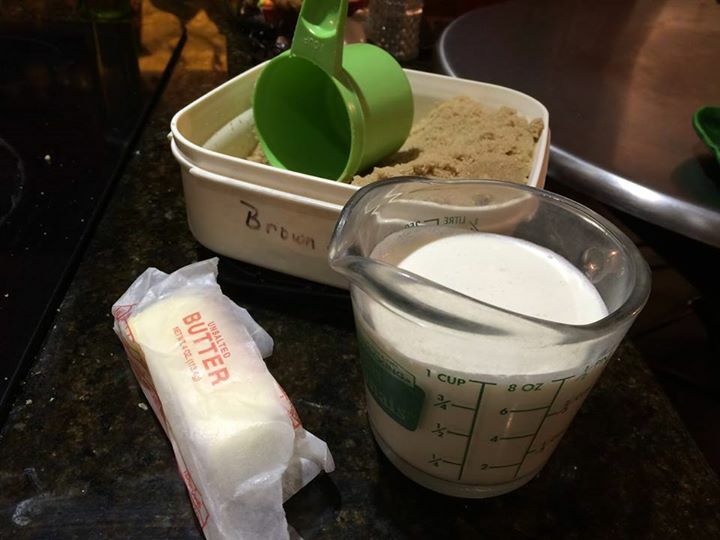 You start by mixing the ingredients for the frosting in a kettle. Brown sugar, cream, and butter. That’s all. Vanilla is optional. Here’s my cousin Naomi getting us started. When I asked her if we should use heavy or light cream, she said, “That depends on whether you have a Guernsey or a Holstein.” Naomi grew up on a farm and she knows more about the fat content of milk than I do. 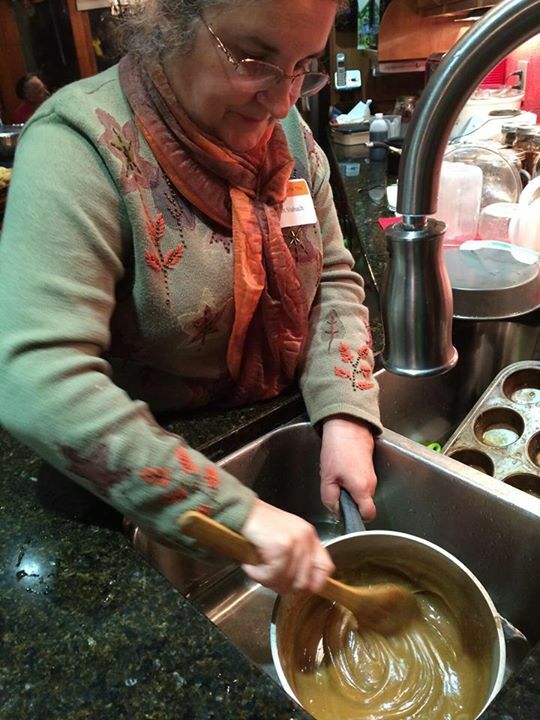 We used 1/2 cup light cream and 1/2 cup heavy cream. Once the ingredients are well mixed, cook on medium-high. Do not stir. Cook until a drop in a glass of water turns into a ball instead of remaining in a string. Cool the mixture. You can set the pan in cold water. Let it cool until you can hold your hand on the bottom of the pan. Really! This is how the directions are written. Who needs a thermometer?! Put more cold water in your sink and start stirring. Holding the kettle in the cold water will make it harden faster. the color is getting lighter! After 9 minutes of stirring – with Naomi doing most of it. My arm was getting tired! You will notice that the color is even lighter. A wooden spoon is recommended. If you’ve ever tasted taffy, you’ll know what this tastes like. Once the frosting is stiff enough, you drop it on the cake and spread it. You don’t want it to run down the sides. You can frost the sides if you’d like, but you don’t want it to be so runny that it runs down the side. 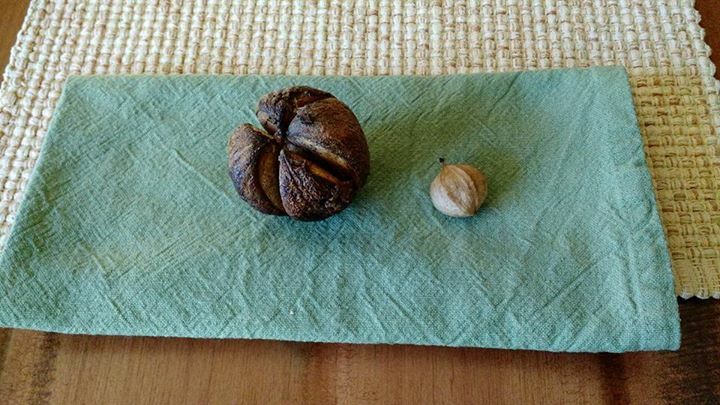 This is what a hickory nut looks like. The one on the left is the nut in its thick, outer shell. The one on the right is, of course, the way it looks when you crack it open to get the nut. No wonder our mothers had their children crack those nuts! Directions: Mix flour and sugar in a saucepan. Add rest of the ingredients. Bring to a boil. Cool slightly, then add about 2 pounds powdered sugar. 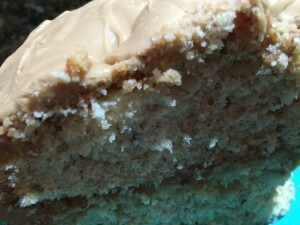 A moist, hickory flavored cake with a caramel frosting. Freezes well. 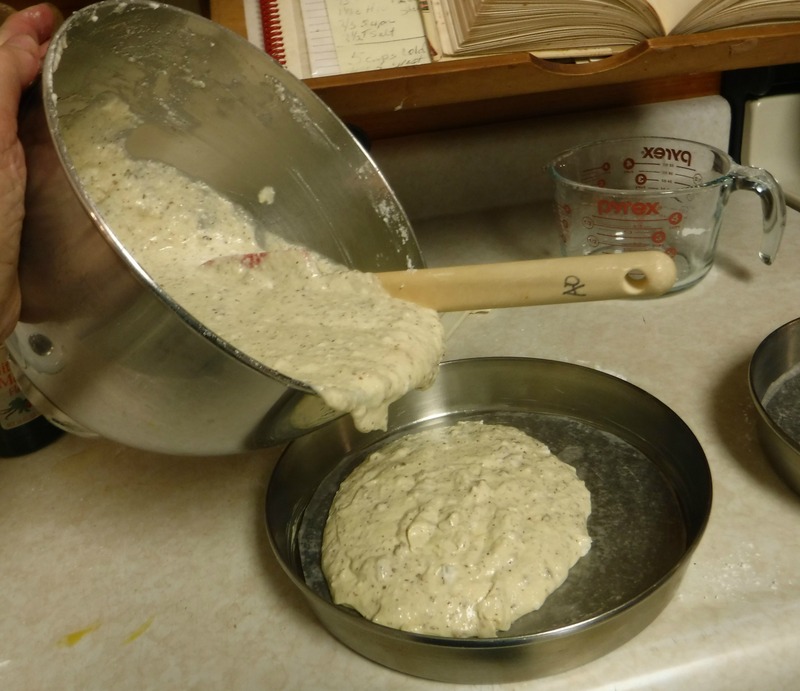 Sift flour and add salt and baking powder to flour. 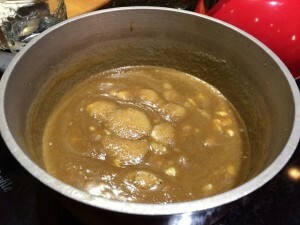 Add flavoring to milk, then alternate dry and wet ingredients until they are mixed well. Beat egg whites until stiff, then add the chopped nuts with the egg whites. Bake at 350 for 30 minutes for a round cake, or for one hour for loaf cake. For the frosting, mix ingredients together in a saucepan. 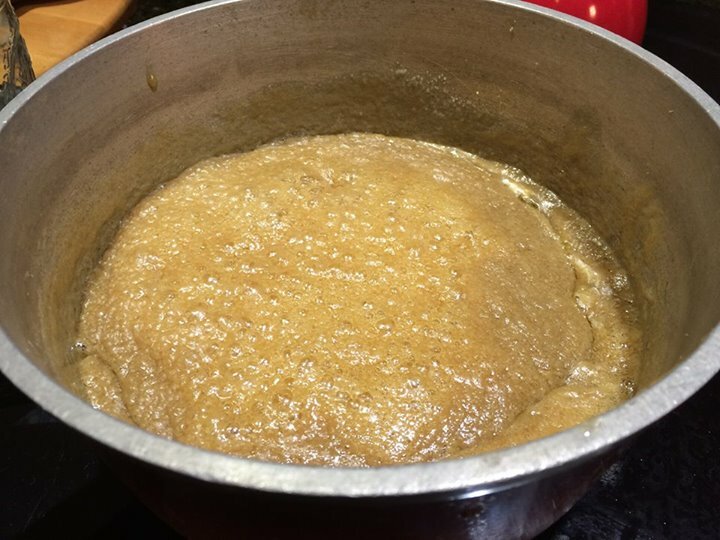 Cook - but do not stir - until the syrup forms a soft ball. (238 on your thermometer). You can test this by putting a drop of frosting into cold water. If it forms a soft ball (and not a thin trickle), then it's right. Allow it to cool until you can hold your hand on the bottom of the pan. 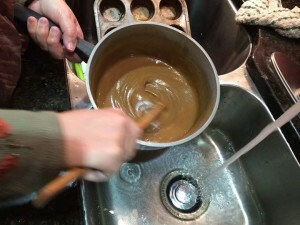 Beat until creamy (works better if you do it by hand instead of with a mixer) and spread on cake. Cover top with whole hickory nuts or chopped nuts. Outstanding cake receipe, my wife & l tried it out this week and the family loved it. Going to take five of them for dessert at the VFW dinner next month. Hi Gert! Wanting to make your cake, but I only have about 1/2 of the amount of Crisco needed, but I do have lard. Do you think it would be ok to substitute? I’m sorry that I did not see this message last evening. I talked to one of my sisters to be sure, and she said she thinks you can use lard. Longer ago, lard was all we had; there was no such thing as Crisco! And this recipe is old enough for “longer ago”! 🙂 Happy baking!